Middlesex Students' Union (MDXSU) has successfully convinced the University's local council to resettle 50 Syrian refugees under the Government-sponsored Gateway Protection Programme. The Leader of Barnet Council, Councillor Richard Cornellius, accepted the request at a Barnet Day of Action Event on 27 September. The move will now go to a Council vote in October. "Barnet has a proud history of providing refuge to persecuted people", says MDXSU Vice-President Sayed Alkadiri. "It is a privilege to continue this tradition, and I look forward to working with this amazing community to help Syrian refugees rebuild their lives". MDXSU launched their #RefugeesWelcome campaign in July 2015 under the umbrella of Citizens UK. They are the first Students' Union in the UK to lobby local government on behalf of Syrian refugees, following successful community campaigns in Islington and Kingston. According to the Students' Union, the main barriers faced by newly arrived refugees and their host communities including finding suitable accommodation, education, healthcare and job opportunities. To answer these concerns, campaigners approached local medical providers, training establishments, landlords and schools to ensure that requirements could be comfortably met. "We wanted to show the Council that these practical concerns had been answered already, so all they needed to do was accept," Sayed says. More than 75 local businesses, schools, churches, mosques and synagogues ultimately participated in the pledge drive. The campaign culminated in the Barnet Day of Action event at the Finchley Synagogue, a symbol of the broad-based support achieved by the campaign. Around 200 guests, including Middlesex University Vice-Chancellor Tim Blackman, attended the celebration. MDXSU is now expanding their campaign nationally to lobby the national government to resettle 1,000 Syrian refugees in the UK before Christmas 2015. "Students' Unions have historically led the way in standing in solidarity with oppressed people around the world", adds Sayed. "It's important for us to work together to face this massive international crisis". 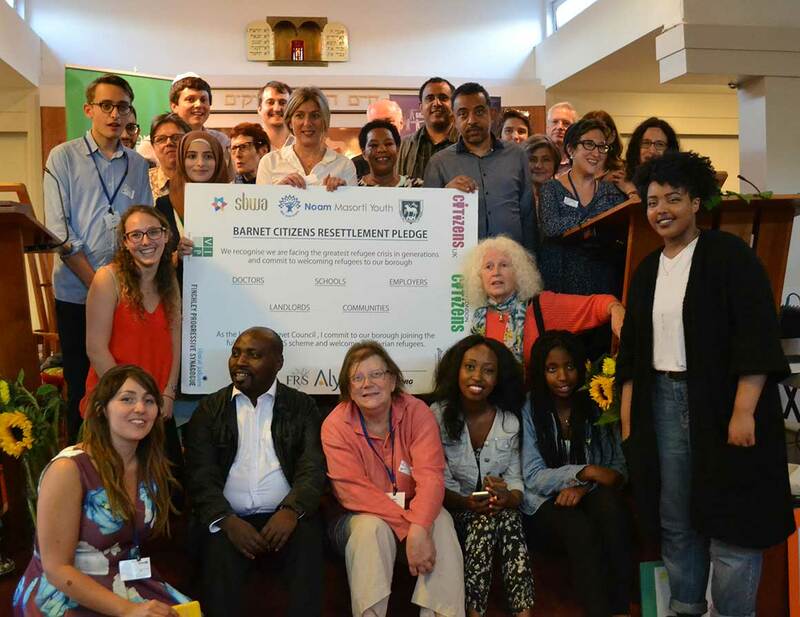 Photo: Barnet citizens present their resettlement pledge at the Finchley Synagogue.